A reindeer walks on the road, in Ranua, Finland. There's good news for Rudolph and friends – an app is helping reduce the number of reindeer killed in traffic accidents. 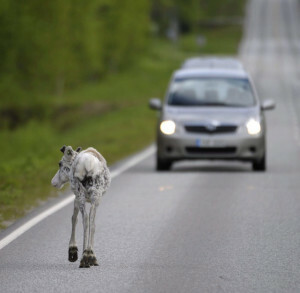 A reindeer walks on the road, in Ranua, Finland. There’s good news for Rudolph and friends – an app is helping reduce the number of reindeer killed in traffic accidents.